Why did you scroll down the page to read the rest of this article? One answer is: because you freely chose to do so. Another answer is: because God has created a world in which that happens. If god created a world where you're determined to scroll down the page as the result of his ultimate causal power, you did not freely do so. You had no choice in the matter and no ability to do otherwise. So these options are indeed in competition. The only way out of this is to define "freely choose" in such a way compatible with this metaphysic, which is undoubtedly theistic determinism. But again, then it's all just semantics. Feser is simply saying "freely choose" is compatible with god causing you to do everything you ever do. If such a critic were consistent, then he would also have to say that the gun that the butler used didn’t really fire any bullets, that the bullets are not really what killed the victim, that the judge and jury didn’t really punish the butler, etc. – all on the grounds that it was really the author who did all these things, since, after all, he was the one who wrote the story that way. (1) Would it have been impossible for the butler to have done something different when he fired the bullets? Yes or no? (2) Did the author ultimately cause the butler to fire the shots? Yes or no? (3) Are the butler's will and actions ultimately caused by the author? Yes or no? But by the same token, to be consistent, we also have to speak of the butler and other characters as if they acted freely. Feser is wrong here again. If you are not the ultimate cause of your thoughts or actions, you don't have libertarian free will. You either have no free will, or some kind of compatibilistic free will. Those are your only options. Looking at the intellect in terms of formal and final causality, if granted, both of these are ultimate caused by god. If all material causes are done by god, your formal causes must be too, otherwise we'd get formal causes that are not in coherence with material causes. The second error involves treating God as if he were simply one further efficient cause alongside all the others in the universe, only more powerful and further back in the line of efficient causes. That's not an error. If god is the ultimate cause of everything—meaning, all subsequent or proximate causes are the result of god's ultimate cause, the latter causes have no more free will than the last domino that falls in a series of falling dominoes: the entire series was determined to happen. Feser is a compatibilist but refuses to admit it, and that poses severe problems of how any kind of hell can be justified given that on Catholicism there is no real free will. I have no doubt a Thomist would want to challenge me on all of the above. But if they want to do so they need to prove how being ultimately caused without the ability to do otherwise, and merely being rational, can properly be called "free will." 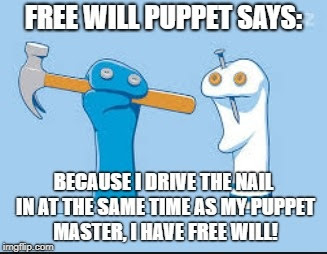 I've argued it is not and that Feser's explanation for free will is woefully inadequate. His lemmings never seem to get that.